California firm's long-anticipated flying motorcycle will set you back $150,000. 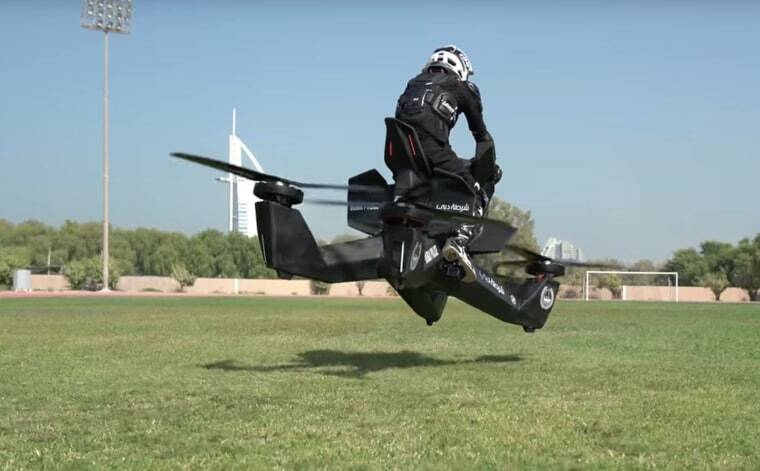 The era of the hoverbike is finally at hand, but you’ll have to be well-heeled to join in. A California company recently announced that it would begin deliveries of its long-anticipated flying motorcycle in the first half of 2019 for an estimated price of $150,000. The Hoversurf S3 looks a bit like what you’d get if you crossed a motorcycle with a quadcopter. It has a seat for one rider and four horizontally mounted electric propellers controlled by a pair of joysticks. The sub-250-pound craft is designed to skim over the landscape at the company-specified “safe altitude" of about 16 feet and at speeds of up to 60 miles an hour. Its lithium-manganese-nickel batteries allow airborne jaunts of up to 25 minutes, according to the manufacturer, San Jose-based Hoversurf. No license is needed to fly the carbon-fiber craft, as its low weight and low speed exempt it from FAA regulations. But with those fast-spinning propellers so close, you might need an extra measure of self-confidence. Hoversurf’s chief operating officer, Joseph Segura-Conn, said the vehicle has numerous safety features, including a computer-controlled system for stabilizing the craft and laser scanners for detecting and avoiding obstacles. To help ensure the safety of the rider and of anyone who might get in the way, the company plans to offer extensive training to customers — and future models will be carried aloft not by propellers but by enclosed fans. “It looks frightening at the beginning, and you’re unsure,” said Segura-Conn, who is one of a handful of people who have flown one of the hoverbikes. “But as soon as you get up in the air, there’s no experience like it.” He said the first deliveries would be next May or June. Hoversurf isn’t the only company developing hoverbikes or similar piloted drones. The Kitty Hawk Corporation of Mountain View, Calif. is developing a one-person electric flying vehicle called the Flyer; the company has been taking pre-orders but hasn’t said when its craft will be commercially available. The British company Malloy Aeronautics is working with the U.S. Department of Defense on a hoverbike that could move soldiers and equipment around a battlefield. And Israel-based Tactical Robotics is developing an autonomous flying vehicle dubbed “Cormorant” to be used to as a sort of air ambulance that can quickly get into and out of dangerous areas to whisk injured soldiers to safety. WANT MORE STORIES ABOUT HIGH-TECH TRANSPORTATION? Will this futuristic flying car ever get off the ground?